My daughters love picture books and they always make a beeline for these whenever we visit our local library. Normally it is the picture on the front cover that inspires them to pick up a book and start reading and this was definitely the case with ‘There’s No Such Thing as Monsters!’ where on the cover we see a very cute cuddly bear peeking out from under the bed covers with only his startled eyes showing! The girls couldn’t wait to read it! 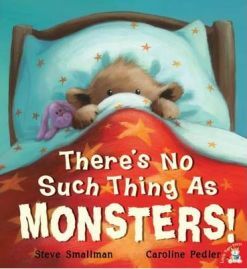 ‘There’s No Such Thing as Monsters!’, which is written by Steve Smallman and illustrated by Caroline Pedler, tells the story of two bears. Small Bear is very excited because at long last he has his own bedroom. Big Bear is also quite happy to have his bedroom to himself too. However the first night in the separate rooms, Little Bear snuggles down to sleep but he can’t nod off because he keeps thinking that he is seeing monsters in the dark. He calls out for Big Bear who comes in to investigate, only to discover that the monster was in actual fact the shadow of a floppy old toy sitting on a chair. This happens a couple more times with Little Bear mistakenly believing that some of the familiar objects in his room are monsters until Big Bear comes in and discovers what it actually is! Big Bear finally settles Little Bear down with his favourite toy – Old Hoppity – and once more they both try to settle down for the night. However, this time it is Old Bear who can’t sleep especially when he hears quite sinister noises coming from Little Bear’s room. Suddenly he feels quite guilty and wonders if there really was a monster all the time. He dashes in ready to rescue the small bear only to discover that this time it has been his imagination playing tricks and Little Bear is actually fast asleep but snoring VERY loudly! ‘There’s No Such Thing as Monsters!’ is a great book told with much humour but it is also a theme that many children can relate to and by telling this story it could well help to alleviate some of their fears – especially as we all know that there are ‘no such thing as monsters!’ It is told in a very simple way but all of the explanations are very plausible. You can really imagine what he is seeing. There is also some great alliteration when Big Bear describes the noises that he hears as there is a lot of ‘snuffling and snorting’ going on! Although this is a great story it would be nothing without the pictures because they really make it come alive. Your child will see what Little Bear thinks that he sees and will also actually see what it is when the lights go on. My older daughter, who is a bit cannier, quickly got the hang of the story so she started to guess what Little Bear was actually seeing. Of course, you can really only do this successfully on the first reading. Another thing to say about the illustrations is that they are so cute! We love the expressions on Little Bear’s face – worry, confusion, relief – they are all depicted beautifully. ‘There’s No Such Thing as Monsters!’ really is a great book for small children and one that my daughters are happy to read over and over again! No Comments on "There’s No Such Thing as Monsters"